She made the best mincemeat pie,” Cousin Diane recalled, and everyone nodded. The minister for the funeral service had asked what made Janet Bennett unique, and this couldn’t be left off the list. 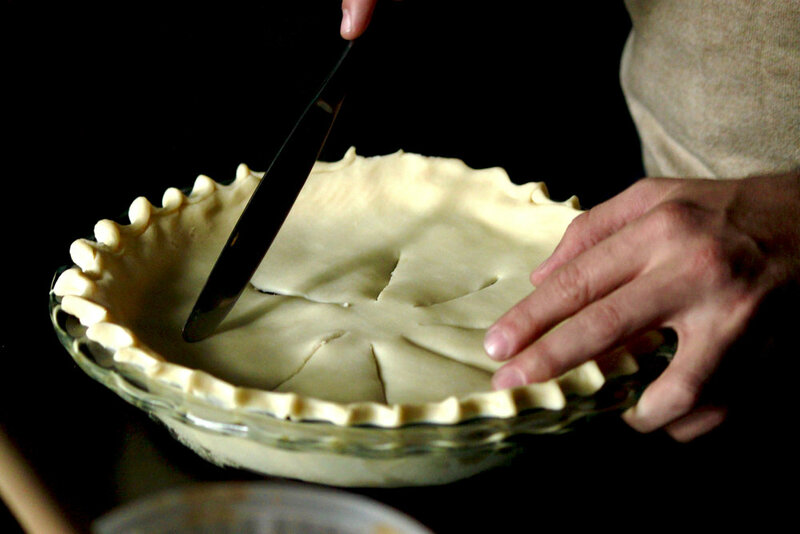 Together with her love of Jeopardy, her skills at sewing clothes for the family, and her impeccable penmanship, the mincemeat pie stood out as an example of Grandma Bennett’s talent, service, and love. Grandma Bennett was a great cook. She wasn’t a chef who showed off through presentation or air but a woman who pulled from her German heritage, her experiences growing up in the Great Depression and WWII eras, and her early years on a farm to produce “comfort food” that drew its quality from basic ingredients rather than complex flavors. In this, though, the mincemeat pie was unique. It wasn’t simply sweet, merely tart, or modestly spiced. The mincemeat was rich in flavors that were hard to pin down directly even though the lling contained only nine ingredients. Grandma would make it every fall, and it always had its place at Thanksgiving dinner along with the traditional apple and pumpkin pies. At the memorial reception following the funeral, I asked Cousin Diane if she had the recipe. “Yes!” she told me. “She gave it to me about a year ago before she started chemotherapy. I’ll send it to you.” Two days later, I got an email with an attachment: a scanned index card covered front and back with that precise cursive handwriting that Grandma Bennett was known to deliver. Armed with the recipe and a calculator app to determine how many cups are in a pint, I set out to purchase the ingredients. I returned $37.07 lighter with the apples, raisins, spices, sugar, vinegar, pie crust, and about twice as many green tomatoes as I ended up using, even after doubling the recipe. Doubling it made sense; Diane had told me she would make up the filling and freeze it to bake in a crust at a later date. That way all the chopping, mixing, and simmering could be done once for multiple pies. As much as I dislike chopping fruits and vegetables, it wasn’t so bad chopping five pints (ten cups) for the mincemeat. While I worked, I reflected on the memories I had of Grandma Bennett in the kitchen, sipping coffee and reading the local newspaper or keeping an eye on an eighteen-quart stock pot of chicken and dumplings. She would write and mail notes to family members on holidays, birthdays, and anniversaries, and she would cut out coupons from magazines to save for future use or to send to one of her daughters. The ingredients seemed too bright and colorful as I added them to the pot, but after they boiled and simmered, the result was the brown, syrupy mixture I remembered. This was Grandma Bennett’s mincemeat even though it was stirred with different hands. The aroma let me know I had the recipe right even before I tasted it. There was no mistaking that mixture of scents from the cloves, vinegar, allspice, and cinnamon. In a way, it was a more fitting incense than any smoking censer swung before a casket. It spoke of hard work, dedication, and love. Grandma Bennett cooked as an act of service and affection for her family, and it will always be remembered as part of who she was. This year, my mother will make the pies for Thanksgiving, but her mother’s love will shine through just the same. I, too, will continue to make mincemeat and share the tradition with those who have yet to taste this unique dessert. Still, whether it’s for old family or new friends, these pies will continue to be a dear memory of a woman who was thoughtful and generous, a woman of strength and wisdom—Grandma Bennett, who made the best mincemeat pie. Mix all ingredients together in saucepan. (We suggest cooking the apples and tomatoes first and adding the rest of the ingredients once they start to soften.) Watch carefully once adding the sugar. Bring to a rapid boil and simmer until thickened (45 minutes to an hour). The Mincemeat can be frozen or baked in pie crusts (top and bottom) at 375° for 25 minutes with foil wrapped around the edges. Then remove the foil and bake for another 25 to 30 minutes. Alfred Custer grew up in South Carolina with his five siblings but made his home in Jackson after moving in 2013 to accept an assistant professor position at the Union University School of Pharmacy. In addition to teaching, Alfred enjoys long-distance running and acting with the Jackson Theatre Guild.